THE PANATHENAIA was an Athenian festival celebrated every June in honour of the goddess Athena. The Lesser Panathenaia was an annual event, while the Greater was held every four years. See also Athena Cult. PANATHENAEA (ta Panathênaia) was a very ancient festival in honour of Athena Polias and Erechtheus (A. Mommsen, Heortologie der Athener, 14 ff., 37 ff. ), said to have been founded by Erechtheus or Erichthonius 729 years before the first Olympiad (C. I. G. 2374, cf. p. 325), called at first Athenaea, but after the sunoikismos by Theseus Panathenaea (Plut. Thes. 24; Suid. s. v. Panathênaia). Pisistratus renewed it with increased splendour, and attached more especial importance therein to the worship of his protecting divinity, Athena. 1. The Greater and Lesser Panathenaea. The Greater Panathenaea was a pentetêris celebrated every fourth year, and was merely an extended and more magnificent performance of the Lesser Panathenaea, which was always from of old held every year (cf. Hom. Il. ii. 551). As each fourth year came round the Lesser was incorporated in the Greater. The procession and the hecatomb always remained the basis of the latter, but the chariot-race also appears to have been considered as belonging to the original festival. Erechtheus is said to have ridden at it himself (C. I. G. l. c.). Pisistratus may be virtually considered as the second establisher of the Greater Panathenaea (Schol. on Aristid. p. 323), though we hear that the performance under the Archon Hippoclides in 566 B.C. was attended by a large concourse of strangers and was widely celebrated, especially as on that occasion gymnastic contests were first introduced. Indeed Marcellinus (Vit. Thuc. § 3) says the Panathenaea was established in the archonship of Hippoclides. The increased splendour of the Greater festival of course diminished the importance of the Lesser: so, though the adjective megala is often found attaching to the Greater (C. I. G. 380, 1068; Boeckh, Staatshaushaltung, iii.3 513), still generally Panathênaia alone is used for the Greater, the Lesser one being styled mikra. The statement in the Arg. to Dem. Mid. 510, that the Lesser festival was a trieteris, is disproved both by such evidence as ta Panathênaia ta kat' eniauton (Rangabé, 814, 32) and also by the fact that inscriptions on vases point to Panathenaea having been held in every single Olympic year (Mommsen, pp. 119, 125). The Greater Panathenaea were celebrated every third Olympic year (e.g. C. I. G. i. 251, by the Archon Charondas in 110. 3; Lys. Accept. Mun. Def. § 1, by the Archon Glaucippus in 92. 3: see other confirmatory arguments in Mommsen, pp. 120, 121); therefore they were held in the same years as the Pythian games. Solon, we know, took a Pythian calendar to regulate the Athenian one, and Pisistratus in many points followed closely in Solon's steps (Mommsen, 122). 2. The date of the Panathenaea. The principal day was the third from the end of Hecatombaeon (about August 13th). Proclus (in Plat. Tim. p. 9) says so expressly of the Greater: and this agrees with Schol. on Hom. Il. viii. 39, where Athena is said to have been born on that day. But Proclus says that the Lesser Panathenaea came immediately after the Bendideia, accordingly on the 21st of Thargelion (about June 8th). But the Greater and Lesser Panathenaea are undoubtedly connected in that the former is but an amplification of the latter so that à priori there is a presumption that they are held at the same time. Further C. I. G. 157 obviously follows the calendar, and it puts the Panathenaea after the sacrifice to Eirene on Hecatombaeon 16th. According to Demosthenes (Timocrates, p. 709, § 28), the Panathenaea are just approaching on Hecatombaeon 11th; but these are certainly the Lesser Panathenaea (Schaefer, Demosth. i. 334; Wayte on Dem. Tim. § 26), as the year is 01. 106. 4, not 106. 3. The argument that the list in Lysias (op. cit. § 4) is necessarily in chronological order is disproved by such lists as Isaeus (de Dicaeog. hered. § 36), and [Andoc.] contr. Alc. § 42, which can be seen from comparison to be certainly not both in chronological order. The evidence for a Panathenaea in the spring is Himerius, who gives as a title to his third speech, eis Basileion Panathênaiois, archomenou tou earos: cf. [Verg.] Ciris, 21 ff. (probably composed in Hadrian's time); but this refers to the Roman Quinquatria, which were called Panathenaea after the disappearance of the older festival (Dionys. Hal. ii. 70). This was only held at the Greater Panathenaea. Pisistratus was of the gens of the Philaidae, who lived in Brauron, where there was a contest of rhapsodes from of old (Schol. on Aristoph. Av. 873). Hence he but transferred to the capital the custom of his village. He introduced recitations of the Homeric poems, which were better regulated by Hipparchus: cf. Plat. Hipp. 228 B; Ael. V. H.. viii. 2. (For the meaning of ex hupobolês and ex hupolêpseôs, see Mahaffy, Hist. of Greek Literature, i. 29, note.) The poems were now sung in much longer portions than before, and probably both the Iliad and the Odyssey as the Neleidae are especially celebrated in the latter (cf. Mommsen, p. 138). In later times other poets (e. g. Choerilus of Samos, fl. 420 B.C.) obtained the privilege of being recited at the Panathenaea (Suidas, s. v. Choirilos). The musical contest proper was introduced by Pericles, who built the new Odeum for the purpose (Plut. Pericl. 13). Previously the recitations of the rhapsodes were in the old unroofed Odeum. There is a very important inscription (C. I. A. ii. 965 = Rang. 961) concerning these musical contests. The part referring to the rhapsodists is probably lost. Then follow five prizes for the kitharôidoi. For the first an olive crown set with gold (stephanos thallou chrusous), value 1000 drachmas and 500 drachmas in silver: for the second, probably a crown value 700, for the third 600, for the fourth 400, and for the fifth 300 (see Rangabé, ii. p. 673). Next two prizes andrasi aulôidois: for the first a crown value 300, for the second one value 100. Next andrasi kitharistais: for the first it appears a crown valued at 500 drachmas, or 300 drachmas in money; for the second probably 200, and for the third 100. The fact that we find andrasi added proves that there were contests of boys too (cf. C. I. G. 2758, Col. i.). The aulêta also got prizes, but the inscription does not record what they were. Note that the prizes in the musical contests are reckoned in money, not in kind, as in the older gymnastic and equestrian contests. The first who won a victory in these musical contests was Phrynis in Ol. 83. 3 (446 B.C. ): see Schol. on Aristoph. Nub. 971 (alter Kalliou to Kallimachou). Plutarch appears to have written a treatise on the Panathenaic music (de Mus. 8). There were not any dramatic representations at the Panathenaea. When we consider the long recitations of the rhapsodes and the musical contests proper, we may allow perhaps three days for this part of the ceremony on a liberal computation, certainly not less than one and a half days (Mommsen, p. 202). There is frequent mention of this contest at the Greater Panathenaea (C. I. G. 251, Rang. 849, 18; Dem. de Cor. p. 265, § 116--a passage, by the way, which shows that proclamations in honour of benefactors were made at the Greater Panathenaea at the gymnastic contest), none for the Lesser: besides, it had nothing to do with the ritual; it was a purely secular and late addition, said to have been first made by the Archon Hippoclides in 566 B.C., or perhaps Pisistratus himself (cf. § 1). The inscription referred to above, C. I. A. ii. 965 (= Rang. 960), also gives details as to the gymnastic contests. The competitors were divided into paides, ageneioi, and andres, the paides being those from 12 to 16 years of age, the ageneioi from 16 to 20, and the andres above 20. Thus neither a pais nor an ageneios could compete as such twice. In later times (Rang. 964) the paides were still further divided e. g. into tês prôtês hêlikias, tês denteras (cf. C. I. G. 1590, paidôn tôn presbuterôn, paidôn tôn neôterôn), the paides tês tritês being doubtless the ageneioi. There is then an event ek pantôn, which means an all-comers' race, but for boys, as is plain from its position before andras. The boys and striplings had their events first: then there was an interval (if a whole night did not intervene); and on re-assembling the men's events took place. According to C. I. A. ii. 965, the paides and ageneioi have five contests,--stadion, pentathlon, palê, pugmê, pankration. According to Rang. 963 (belonging to the late period of the Diadochi), the paides have six, while the ageneioi still have only five. Perhaps the dolichos, which was added, was for all below the class of andres. The men's contests were, according to x. i. a. 966 (= Rang. 962), of 190 B.C., dolichos, stadion, diaulos, hippios (=a double diaulos), pentathlon, palê, pugmê, pankration, hoplitês (= race in armour). Note the order of the events, though in Plato's time the stadion came first (Legg. viii. 833 A): cf. C. I. A. ii. 965. The races were run in heats (taxeis) of four each (Paus. vi. 13, 4); the victors in the heats afterwards running together. There were prizes for the first and second in the deciding heat in the ratio of 5: 1 (= ox: sheep, cf. Plut. Sol. 23): see C. I. A. l. c. The prizes consisted of oil from the moriai in the Academia, given in special prize amphorae, which were called amphoreis Panathênaïkoi (Athen. v. 199). The oil was meant to be sold, and could be exported free of duty (ouk esti d'exagôgê elaiou ex Athênôn ei mê tois nikôsi, Schol. on Pind. Nem. x. 64). The number of amphorae given, according to the inscription referred to, was about 1450, and the value (1 amphora worth 6 drachmas) about 1 talent 2700 drachmas (see Rangab, ii. p. 671). The gymnastic games probably lasted two days, certainly not less than one (Mommsen, 202). There is plenty of evidence for an equestrian contest at the Greater Panathenaea, none for the Lesser; though there may have been a kind of ceremonial race, more as a matter of worship than as a contest in which the victors got substantial prizes. None of the evidences for Athlothetae (cf. § 11) at the Lesser Panathenaea are absolutely conclusive, yet we may perhaps suppose that there was an equestrian contest on a small scale at this festival (Mommsen, 124-127). To understand thoroughly the many events of this division at different times, the reader must study the inscriptions in C. I. A. 965 b = Rang. 960 (380 B.C. ), 966 = Rang. 962 (190 B.C. ), 968 (166 B.C. ), 969 (162 B.C. ), C. I. G. 1591 (250 B.C. ), and above all the elaborate table of the comparison of these inscriptions in Mommsen (Taf. IV.). The multifarious details can only be set forth in such a table, and any one who wants to study them very closely must be referred to it. Here we can merely give an idea of the plan, noticing that the events appear to have increased in number as time went on. The first and chief event, the one which legend said Erechtheus introduced, was that of the apobatês (cf. tês apênês kai tês kalpês dromos at Olympia in Paus. v. 9, 1 and 2). A charioteer (hêniochos egbibazôn or zeugei ebibazôn) and a companion, as in the Iliad, occupy the chariot. The companion (here called apobatês, not paraibatês) leaps out (hence his name) and again up (hence sometimes we find him also called anabatês), partly helped by the driver (who thus gets his title egbibazôn), partly by kinds of wheels called apsbatikoi trochoi (Mommsen, p. 154). The son of Phocion (Plut. Phoc. 20) took part in this contest, so it must not be inferred from its absence in C. I. A. ii. 965 that it did not exist in 380 B.C. It is really broken off the inscription. The second division in Mommsen's table is. ordinary riding and driving, without any relation to ritual or war. Here the horses are divided into foals and full-grown horses; they are yoked either singly, or two or four together; and the races are divided into diauloi and akampioi. Then there are various permutations and combinations that may be made of these (e.g. sunôridi pôlikêi, kelêti teleiôi, harmati teleiôi in C. I. A. ii. 968): but there is no diaulos ever for a single horse, only for a yoke or a pair, and not even for these in the case of foals. The third division consists of what we may call military competitions, and they are much the same as the second division, only there do not appear so many combinations (e.g. ib. harmati polemistêriôi, hippôi polemistêi). There is no need to suppose that these contests were exclusively confined to the cavalry (Mommsen, 161-2). The fourth refers to the procession in honour of Athena, and always consisted of four horses zeugei pompikôi diaulon or akampion. The fifth was of javelin-throwers from horseback, a contest which soon disappeared. Notice further that several events are for all comers (ek pantôn): cf. C. I. A. 968, 42 ff., as opposed to those for Athenians only (tôn politikôn). 2nd Class. hippôn pôlikôi zeugei (40:8). hippôn zeugei adêphagôi (140:40); i. e. teleiôi (see Hesych. s. v. adêphagos); was probably a slang word for the great expense. such splendid racehorses entailed. 3rd Class. hippôi kelêti nikônti (16:4). 5th Class. aph' hippôn akontizonti (5:1). The amateurs who took part in the contests of the second class are the best rewarded; and it was to encourage them to spend their money on keeping horses that these events were made the most distinguished. In C. I. A. ii. 966, 41, king Ptolemy Epiphanes appears as victor among them in the diaulos with a chariot. The place for both the gymnastic and equestrian contests was perhaps the Eleusinium (Köhler to C. I. A. ii. 2, p. 392), or the deme Echelidae, W. of the Piraeus (Steph. Byz. s. v. Echelidai: Etym M. s. v. Enechelidô, 340, 53; Mommsen, 152. Yet cf. Milchhöfer in Baumeister's Denkmäler, s. v. Peiraieus, p. 1200). It took up a day probably, though possibly only half a day (ib. 202). (a) That called Euandria (euandria) was a means by which the leaders of the procession were chosen. It was a leitourgia, [Andoc.] in Alcib. § 42, and he who performed it chose out of his tribe a certain number--perhaps about twenty--four, the number of a chorus--of the tallest and best looking members, and arrayed these with proper festal garments. A member of another tribe did the same, and probably only two tribes contended, as no second prize appears in C. L. A. ii. 965. From this contest strangers were expressly excluded (Bekk. Anecd. 257, 13). Sauppe and Köhler consider that there were two companies who contended in each case in the Euandria, one of seniors, the other of juniors; perhaps the contest of the seniors was called euandria in the special sense, and that of the juniors euoplia: cf. Rang. 964 and Mommsen, 168. (b) The Pyrrhic dance, performed at both the Greater and Lesser Panathenaea (Lys. Accept. Mun. Def. § § 1, 4). With the Euandria and the Lampadedromia it belonged to the more strictly religious part of the festival (cf. Aristoph. Nub. 988 and Schol.). Athena was said to have danced the Pyrrhic dance after her victory over the Giants (Dionys. Hal. vii. 72). As belonging to the religious part of the festival, the prize was an ox for sacrifice, and bore the special title of nikêtêrion (cf. Xen. Cyr. viii. 3, 33, where the ox alone is called nikêtêrion, not the goblets: also Mommsen, 163; Rangabé, ii. p. 671). There were Pyrrhic dancers of all three ages--paides, ageneioi, and andres. A relief published by Beulé (L'Acropole d'Athènes, ii., last plate but one) presents eight armed youths performing the Pyrrhic dance. A full body of Pyrrhicists would then be twenty-four, the number of a comic chorus. They wear a light helmet, carry a shield on their left arms, but are otherwise naked. How the victory was gained in the Pyrrhic dance and the Euandria is not stated; probably by decision of a judge. The. figure on the left of the relief may be perhaps. the judge. (c) The Lampadedromia the prize of which in C. I. A. ii. 965 was a hydria of oil (cf. Schol. in Pind. Nem. xv. 61), value 30 drachmas. This was the night of the 28th (the day being reckoned from sunset to sunset). The Lampadedromia was the first event in it. Then followed during the greater part of the night litanies (ololugmata) by the elder priestesses, which were originally prayers and thanksgivings for the harvest, and subsequently songs of joy for the birth of Athena. Mommsen (p. 171, note) thinks that possibly the conclusion of the Eumenides may have reference to the ceremonies of the Panathenaic pannychis. There were also dances by the younger priestesses, and towards morning songs by cyclic choruses (cf. Lys. op. cit. § 2) of youths and men (neôn t'aoidai chorôn te molpai, Eur. Heracl. 779, a passage comprising many features of the Panathenaea, which, however, must not be taken as expressing the order in time, only the order in importance of the several events). The kind of songs the men sang may perhaps be partly seen in the dithyramb of Lamprocles in Bergk (Lyr. Graec. iii. p. 554: cf. Aristoph. Nub. 967 and Schol.). The hieropoioi got next to nothing for the expenses of the Pannychis, only 50 drachmas, and this had to compensate much other outlay besides (Rang. 814, 27-30, and his note). 8. The Procession and Sacrifices. The procession was most splendid. It comprised the victors in the games of the preceding days, the pompeis or leaders of the sacrifices, both Athenian and those of strangers (for the colonies and cleruchies used to send sacrifices to the Panathenaea, e. g. Brea, C. I. A. i. 31), a large quota of cavalry (for Demosthenes, Phil. i. p. 47, § 26, speaks of hipparchoi: cf. Schol. on Aristoph. Nub. 386), the chief officers of the army, taxiarchoi and stratêgoi, dignified elders (thallophoroi, Xen. Symp. 4, 17), bearing olive branches (thalloi), doubtless with their metoikoi as skaphêphoroi following, in later times the ephebi splendidly equipped: while of women there was a long train of kanêphoroi, with the wives and daughters of the metoikoi as their skiadêphoroi and diphrophoroi : then the Athenian people, generally marshalled according to their demes. Though the frieze of the Parthenon reproduces some points, especially the genuine Athenian element of the Panathenaic festival, still it must not be supposed that it reproduces all the details; e. g. the metoikoi, of whom we have most specific, evidence, do not appear. One of the most striking features of the procession was the Peplus, worked by ergastinai, superintended by two arrêphoroi and certain priestesses, which was destined for the ancient statue of Athena Polias, according to certain prescriptions of the Delphic god. Pisistratus probably intended that a new peplus should be brought every four years; the Elean maidens wove a peplus for the goddess only once in every four years (Paus. v. 16, 2); but in republican Athens a new peplus was made each year (Schol. Aristoph. Eq. 566). In the time of the Diadochi portraits of some of these were placed where the figures of the gods should have been (Plut. Demetr. 10). The peplus was suspended like a sail from the yards on the mast of the Panathenaic Ship (Schol. on Hom. Il. v. 734), which was an actual ship, very large and beautiful. The marvellous appearance of a ship going through the streets was effected by subterranean machines (Philostr. Vit. Soph. ii. 1, 5, p. 236 Kayser; Paus. i. 29, 1), of which we should very much like to have further information. The Athenians had become a seafaring people, and they wished to signify it: the time of the agrarian Athena was passed (Mommsen, 188). 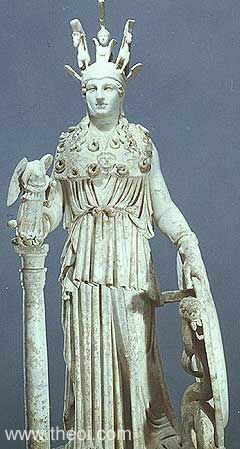 On the peplus were represented the aristeia of the goddess, especially her victory over Enceladus and the Giants (Schol. on Eur. Hec. 466; Suidas, s. v. Peplos). It was considered a great sight for the populace (Plaut. Merc. prol. 67). The statement that the officials of the greater festival were the Athlothetae, not the Hieropoioi, is confirmed by cc. 54 and 60. In c. 49 it is mentioned that the selection of weavers of the sacred peplos (p. 327 a) was first in the hands of the boulê, and afterwards of a dikastêrion. The procession, marshalled mainly in the, outer Ceramicus, partly inside the town, passed through the market-place to the Eleusinium at the east end of the Acropolis (cf. Schol. to Aristoph. Eq. 566), turned round this to the left, and passed along the Pelasgicon, north of the Acropolis, and so reached the Propylaea (Philostr. l. c; cp. Xen. Hipp. 3, 2). Then some of the members performed the sacrifice to Athena Hygiaea, while others offered a prelimiuary sacrifice on the Areopagus. Prayers accompanied these offerings, and we hear of prayers being offered for the Plataeans at the Greater Panathenaea (Herod. vi. 111). On entering the Acropolis, which was only allowed to genuine Athenians, there was the sacrifice of one cow to Athena Nike (Rang. 814, 20); after this followed the. hecatomb to Athena Polias, on the large altar in the eastern part of the Acropolis. In earlier times the hecatomb was offered at the Erechtheum. After the procession followed the hestiasis. The flesh of the victims was given, according to demes, to a certain fixed number out of each deme. The skaphêphoroi supplied bread and cakes. The boat-race was a supplementary event on the 29th of Hecatombaeon, the day on which ships are to be drawn down to the sea (Hes. Op. 815). It was held every four years in the Piraeus in honour of Poseidon (identified with Erechtheus) and Athena. The difference of locality forbids our associating it with the Sunian regatta, though this was also held only once in four years (Herod. vi. 87; Lys. op. cit. § 5). In connexion with this part of the festival the orator Lycurgus, in whose family was the priesthood of Poseidon Erechtheus, established three cyclic choruses (Westerm, Biogr. Min. 273, 50) in honour of that god, with valuable prizes. 10. The Calendar of the Panathenaea. For the Lesser Panathenaea (which was the nucleus of the Greater) the chief day of the festival was the 28th of Hecatombaeon; it comprised the pannychis, the procession, the sacrifices, and the feasting: and the 27th sufficed for the horseraces (when there were any), the Euandria and the Pyrrhic dances. At the Greater Panathenaea these days were allotted to the same events. But the day on which the festival began will vary according as we allow a longer or shorter period for the three chief contests: thus the Musical contest might last three days or 1 1/2 days, the Gymnastic two days or one day, and the Equestrian one day or half a day. According, then, to the longer period, the Panathenaea would begin on the 21st; according to the shorter, on the 24th. The longer period has the advantage that it leaves the afternoons free for prelections (K. F. Hermann, Gr. Alt. 54, 24) or dinner-parties (Xen. Symp. init.). The shorter will suit Thucyd. v. 47 better; cf. Mommsen, 204, 205. 11. The Officials of the Festival. (1) The ten Athlothetae, one chosen from each tribe. They held office for four years, and their function, as Pollux says (viii. 93), was to arrange the musical, gymnastic, and equestrian contests at the Panathenaea. We find in inscriptions that they received subsidies from the tamias of the sacred chest of Athena (C. I. A. i. 188). (2) The Hieropoici, who managed the Lesser Panathenaea (Rang. 814, 32). They appear to have had nothing to do with the specially Greater festival (Etym. M. p. 469, 4). (3) The Gymnasiarchae, who especially superintended the Lampadedromia (4) The Demarchs, who marshalled the people in demes for the procession and for the hestiasis (Schol. on Aristoph. Nub. 37; Suidas, s. v.). Concerning those who had perquisites in connexion with the festival, such as the manteis and archons in the kreanomiai, see Rang. 814. Panathenaea outside Athens may perhaps be inferred from Panathênaia en Athênais in C. I. G. 1068. We are told that Themistocles established Panathenaea in Magnesia (Ath. xii. 533), and in Teos there was a guild of Panathenaistae (C. I. G. 3073). The cleruchs no doubt celebrated the festival abroad. Source: Dictionary of Greek and Roman Antiquities. "Sokrates : Where have you come from now, to pay us this visit? From your home in Ephesos? Ion [a singer of Homeric rhapsodies] : No, no, Socrates; from Epidauros and the festival there of Asklepios . . .
Sokrates : Now, mind that we win too at the Panathenaia. Ion : Why, so we shall, God willing." "You looked as if you had made up your mouth to whistle the flute-prelude of the hymn to Athena." "Sokrates : And so you believe that there was really war between the gods, and fearful enmities and battles and other things of the sort [i.e. the war of the Gigantes], such as are told of by the poets and represented in varied designs by the great artists in our sacred places and especially on the robe which is carried up to the Akropolis at the great Panathenaia? for this is covered with such representations." "Sokrates : Hipparkhos [an Athenian tyrant late C6th B.C.] . . . among the many goodly proofs of wisdom that he showed, first . . . compelled the rhapsodies at the Panathenaia to recite them in relay, one man following on another, as they still do now." "As a tribute of praise, chanted as it were duly and truly, in honor of the Goddess on this her day of Festival [i.e. the Lesser Panathenaea, held early in June]." "He [the mythical king Erikhthonios] set up the wooden image of Athena in the acropolis, and instituted the festival of the Panathenaia." "I hold that the Panathenaia festival [of Athena held at Athens] was not founded before the Lykaian [festival of Zeus held in Arkadia]. The early name for the former festival was the Athenaia, which was changed to the Panathenaia in the time of Theseus, because it was then established by the whole Athenian people gathered together in a single city . . . My view is that Lykaon [founder of the Lykaia festival] was contemporary with Kekrops [founder of the Panathenaia], the king of Athens, but that they were not equally wise in matters of religion." "Among the Athenians also beside the holy dwelling [of Athene] pitchers sit, a symbol not of ornament but of wrestling." [N.B. The jars were given as prizes in the games of the Panathenaia]. "During the celebration of the Panathenaia, when the courts do not convene, he said, ‘It is the natal day of Athena Alektor (the Rooster) and today is an unjust day (miara hemera).’"
"Hipparkhos son of Peisistratos as the oldest of his father's children and the wisest of the Athenians. He first introduced the poems of Homer to Athens and obliged the singers to perform them at the Panathenaia." "Erichthonius [mythical foster son of Athena] first invented the four-horse chariot . . . in his youth established the Panathenaic Games for Minerva [Athena], himself competing in the four-horse chariot race. In return for these deeds he was placed among the constellations." "That day was Pallas' festival [i.e. the Panathenaia in Athens] and virgins carried, in the accustomed way, in baskets, flower-crowned, upon their heads the sacred vessels to her hilltop shrine." "Panathenaia : two sorts of Panathenaia were held at Athens, one every year, the other on a five-year cycle, which they called the Great Panathenaia. The first to hold the festival was Erikhthonios the son of Hephaistos. The Panathenaia were previously called the Athenaia." "Arrenophorein (to carry the sacred objects) : Four women used to be elected [by the Athenians], from those of noble birth, who would begin the weaving of the robe [the ceremonial robe of Athena of the Panathenaia] and the other things pertaining to it. They used to wear white clothing. If they put on gold ornaments, these became holy." "Peplos (Robe, peplos) : In a special sense, amongst the Athenians, a peplos is the fastening of the Panathenaic temple, which the Athenians used to prepare for the goddess every four years; they also used to process in her honor through the Kerameikos as far as the Eleusinion. They call this garment a peplos because of its being woollen. Enkelados, whom Athena destroyed, wrote on it; he was one of the Gigantes. Alternatively it was because the Athenians after a victory made a robe for Athena and inscribed the names of the best fighters on it. Peplos: concerning the robe taken up for Athena at the Great Pananthenaia there is information on record not only in the orators but also in comedy." "Lampados (Of a torch). And with torches. Athenians celebrate three torch-festivals, at the Panathenaia [of Athena], Hephaistia [of Hephaistos] and Promethia [of Prometheus]." "Trapezophoros (Table-bearer) : Table-bearer is a name of a priestess-ship; and it is stated that both she and the priestess of Pallas jointly manage everything with the priestess of Athena." Plato, Euthyphro - Greek Philosophy C4th B.C. Plato, Hipparchus - Greek Philosophy C4th B.C. Plato, Timaeus - Greek Philosophy C4th B.C.